"Antipasti" redirects here. For the music group, see Anti-Pasti. Antipasto (plural antipasti) is the traditional first course of a formal Italian meal. Typical ingredients of a traditional antipasto include cured meats, olives, peperoncini, mushrooms, anchovies, artichoke hearts, various cheeses (such as provolone or mozzarella), pickled meats, and vegetables in oil or vinegar. Seafood platter; calamari, mussels, smoked salmon, tuna fish, olives. An antipasto platter with smoked salmon, smoked chicken (underneath), roast beef, pâté, cabana sausage, brie-style cheese, cheddar-style goats milk cheese, Jensen's red washed rind cheese, olives, tapenade, rocket pesto (behind the dish), and tomato chutney. The contents of an antipasto vary greatly according to regional cuisine. 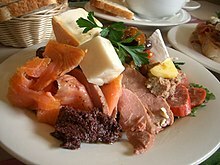 It is quite possible to find different preparations of saltwater fish and traditional southern cured meats (like soppressata or 'nduja) in the south of Italy, whereas in northern Italy it will contain different kinds of cured meats and mushrooms and, especially near lakes, preparations of freshwater fish. The cheeses included also vary significantly between regions and backgrounds, and include hard and soft cheeses. Many compare antipasto to hors d'oeuvre, but antipasto is served at the table and signifies the official beginning of the Italian meal. It may also be referred to as a starter, or an appetizer. ^ "Definition of ANTIPASTO". www.merriam-webster.com. Scicolone, Michele (1998). The Antipasto Table. HarperCollins. ISBN 9780880016278. Retrieved April 20, 2012.